"… one of the essential big-band recordings of the ‘90s to date by a composer/arranger who has the promise to become a major voice." 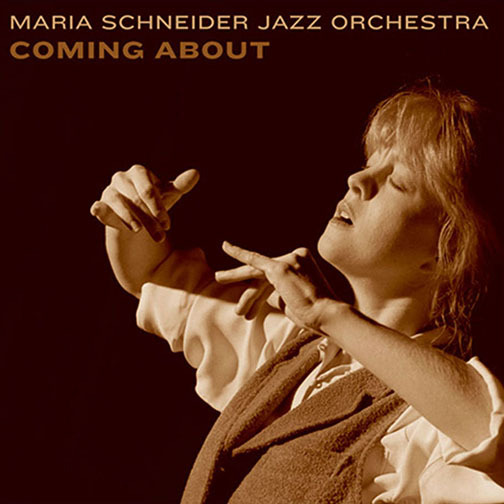 "Composer arranger-bandleader maria Schneider continues to refine her considerable skills as a writer, producing some of the most atmospheric orchestrations this side of Gil Evans." "These are beautifully crated tone poems, full of color and texture. The discreet ebb and flow of the three-movement suite, is the work of a great talent in the making." "'El Viento,' a skillful blending of colour and structure, is quite unlike anything else attempted by a jazz orchestra." – BBC MUSIC – S.N. "At the heart of the album is 'Scenes from Childhood,' a long, three-part suite with great contrasts of mood and pace. It builds tension in its first two movements only to release it in the glorious final movement, 'Coming About.' … This is some of the best big band music around." "Schneider is one of the best composer/arrangers working today. This disc showcases her unusually mature skills as her exceptional band brings her musical vision to light." "Schneider, 35, further stamps herself as a brilliant composer-arranger with this album of mainly commissioned work." "Big bands were supposed to have died decades ago, but have proven resilient. Some of the reasons why can be heard in Maria Schneider’s marvelous Coming About, her second album as a bandleader. In full flight – as in her arrangement of John Coltrane’s 'Giant Steps' or 'Bombshelter Beast' – there is no sound like it in jazz. There are no vamp-till-you-dro' sections or grab-bag licks. Schneider understands her instrument and respects it. But she’s also fearless. Evans would have been proud." "Coming About is a document of a working band, tight and fluid. It features often mysterious music, a little eerie and mostly introspective. She likes engulfing textures, chords that billow. There’s very little shouting, and not much playfulness; this is earnest music. But the soloists consistently understand the material and keep their improvisations keyed to the arrangements; the improvisers sound as if they have played the material before, which gives the recording a sense of integration."